Living in the country now, I can’t tell you how many cats and dogs just get dumped. So far I have seen a lot more cats than dogs. My husband grew up on a farm and they had probably a handful of animals a year just get tossed. 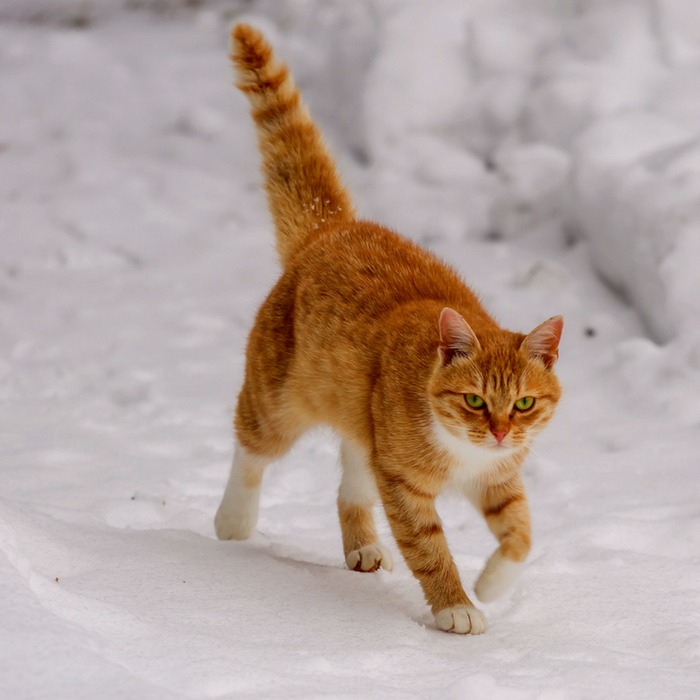 Having a winter cat shelter for feral cats roaming around is a great way to protect them from the elements. I wanted to share a few easy do-it-yourself ideas and then shelters you can buy and put out for these cats. So if you aren’t a fan of DIY projects you can buy a shelter just the same and get it set up. I find it quite sad how many cats roam without a home. I am thankful their cat instincts kick in and they can hunt for food, but it’s still sad. Not knowing when they will get another meal. When I see a lost cat or a feral cat that you can tell has no home, I can’t help but feed it. I just love animals and they deserve all the love we can give them. Shortly after we moved here there was an orange cat that showed up at our country home. He was living in our barn, and finally, after a week he began eating the food we left out for him. He was so timid and scared and kind of bullied our other cats. You could tell he needed lots of love, but mostly a safe spot and food to bring him comfort. He finally ran away from here but stayed around for six months or so. This is one of the cheapest do-it-yourself projects. Take a styrofoam cooler and cut a small circular hole on one of the sides. This will be where the cat can enter. Add in some straw and secure the lid and find a good place to set it out. You can also ask medical supply stores and such if they have any coolers, as most have items shipped to them in these and they end up in the trash. Do you have an old cooler that you took to the beach that no longer works for you or you got an upgrade? You can easily make it a shelter with an entrance hole and some straw inside. An affordable option as well is to grab some plastic bins and create a shelter. Take two bins that are close in size but leave a little gap. Fill the gap between the larger and small storage bin with straw, to create insulation. Followed by creating a hole they can get in and out easily. Next, put some straw on the floor and you have an affordable and easy winter cat shelter! If you own an old dog home or come across one for cheap, buy it! Add some plywood to the entrance so it blocks the entrance. Put just a small circular hole big enough for a cat to go in and out. This helps protect them more from larger predators and keeps it warmer. Toss in some straw and you have a shelter waiting for them. You can buy a heated shelter to keep your outdoor cats nice and cozy on those cold chilly nights. What is unique about this shelter is there are two exits so they have less of a chance of getting trapped by a predator. This insulated tube house is nice and compact and can be placed on the side of a house and kind of blends in. Great for keeping stray cats nice and warm and protected. When you decide on a location make sure it is free of dogs and other animals in range. 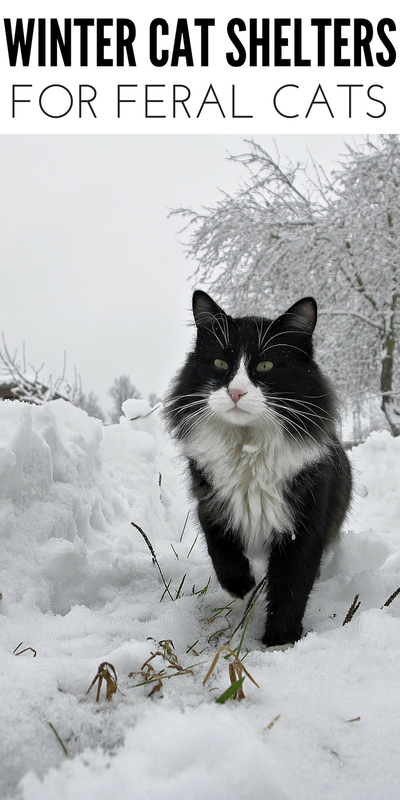 Clean the front area from snow so that the cat won’t get caught inside and if you feel like it you can offer food and water. Helping a feral cat have a warm and safe place to eat is a huge blessing to them.